Functions: hours, minutes, small seconds at 3 o’clock. Date. Chronograph: 30-counter at 9 o'clock, central chronograph seconds. Tachymeter scale on the flange. Case: 42 mm diameter. Microblasted titanium. Red anodised aluminium pushers. 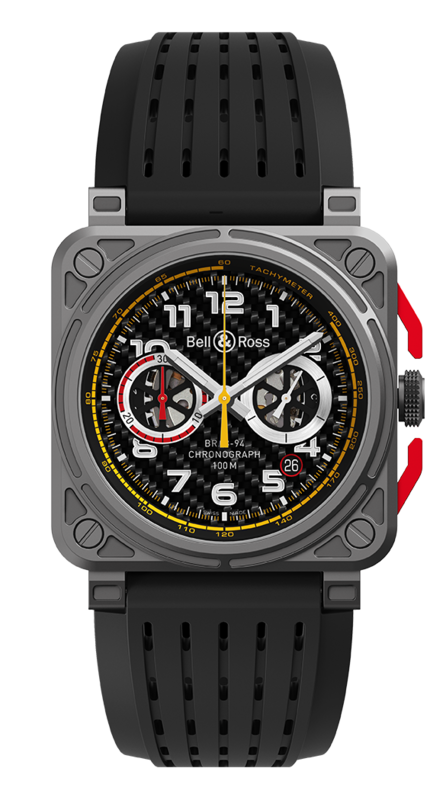 Dial: carbon fibre. Metal applique Superluminova®-filled numerals. Metal skeletonised Superluminova®-filled hour and minute hands. Straps: black perforated rubber and ultra-resilient black synthetic fabric.